Avalokiteshvara (Tib: spyan-ras-gzigs), the 'Lord who ceaselessly gazes over the realms of existence', is the bodhisattva of great compassion. In his four-armed white aspect he is the recognized as the patron deity of Tibet who successively manifests in the bodily form of the Dalai Lama. He sits in vajra-posture upon a moon disc and a multicoloured lotus, with his two principal hands palms-folded in anjali-mudra before his heart as he cups a wish-fulfilling jewel. His second right hand holds a crystal rosary of a hundred and eight even-sized beads, while his second left hand holds the stem of an immaculate white lotus. His four hands represent the 'four immeasurables' of compassion, love, sympathetic joy, and perfect equanimity. A transparent rainbow encircles his radiant body as he sits amidst a landscape of rock, clouds and water. 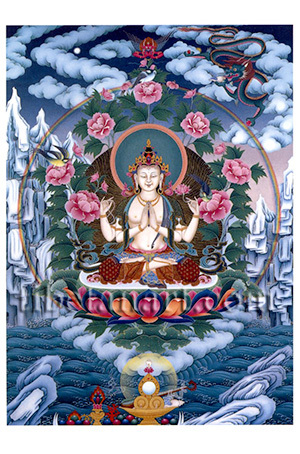 Colourful birds and pink flowers surround his aura, and the large cloud-borne leaf that supports his lotus seat glistens with fresh dewdrops. The full moon, the sun, a garuda, and a turquoise dragon appear in the cloud-capped sky. In the lower foreground are the sense offerings of cymbals, a mirror, a lute, incense and a perfume-filled conch that rest within a golden bowl, and behind these are jewels and the possessions of a chakravartin or 'universal monarch'. Avalokiteshvara is traditionally invoked by his six-syllable mantra, OM-MA-NI-PA-DME-HUM.